Chimney Crown Repair in Livingston, Essex County, New Jersey, NJ. 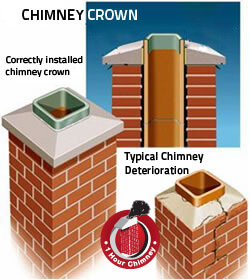 The chimney crown (also referred to as the chimney wash) is the top element of a masonry chimney. It covers and seals the top of the chimney from the flue liner to the chimney edge. The crown should provide a downward slope that will direct the water from the flue to the edge of the crown. The overhanging drip edge, by directing the run-off from the crown away from the chimney, helps prevent erosion of the brick and mortar in the chimney’s vertical surfaces.